It’s been a little while since our last blog post. After a busy summer, everyone was squeezing in some last minute vacation time, so a few weeks elapsed without a post. I was back from vacation for one week and then immediately took off on a two week, 3,000+ mile road trip for the KTM rally in Crested Butte, CO (where I am now) and the Horizons Unlimited Travelers Gathering in Mariposa, CA. I’m writing from my camper in Crested Butte, connecting to the internet via my phone, looking out the window at our booth, and keeping an eye out for customers. Pretty much all the riders are out riding now, so I’m taking advantage of this little break in the action to post a quick – and long overdue – update. The focus for today’s blog: Reckless 80 design revisions. We’re now essentially sold out of the Reckless 80 (the Reckless 40 is still in stock). I have some with me here at this show, and we’re keeping a few at the warehouse for our own purposes, but aside from that we’re now looking toward the Spring 2016 production order, and thinking about some design revisions, taking into account all the feedback we’ve received over the last few months. There are a number of revisions to stitching, hardware, and construction which I won’t detail here because a) it’s a lot and b) it’s not all that interesting. Mostly we’re just adding bartacks, webbing, and reinforced stitching in a variety of spots to add strength and long-term durability. Most of those construction revisions are fairly straight-forward, so in this post I’ll focus on the design revisions instead. We’re changing from a one-piece harness to a three-piece harness. There are a number of advantages to this. First, it’s easier to manufacture and easier to repair, because three individual pieces can be run through a sewing machine much easier than one large piece. Second, it’s less expensive to ship, both from the factory to us, and also from us to the customer. Third, it can be more easily packed for fly-to-ride trips, like the one I did in SE Asia last winter. And finally, in the event of a crash, the individual pieces can be replaced individually, without having to replace the entire bag. The three pieces will be connected by chicago bolts. Here are a few pics of the rough mock-up we made in the shop by cutting up one of the current version R80s. 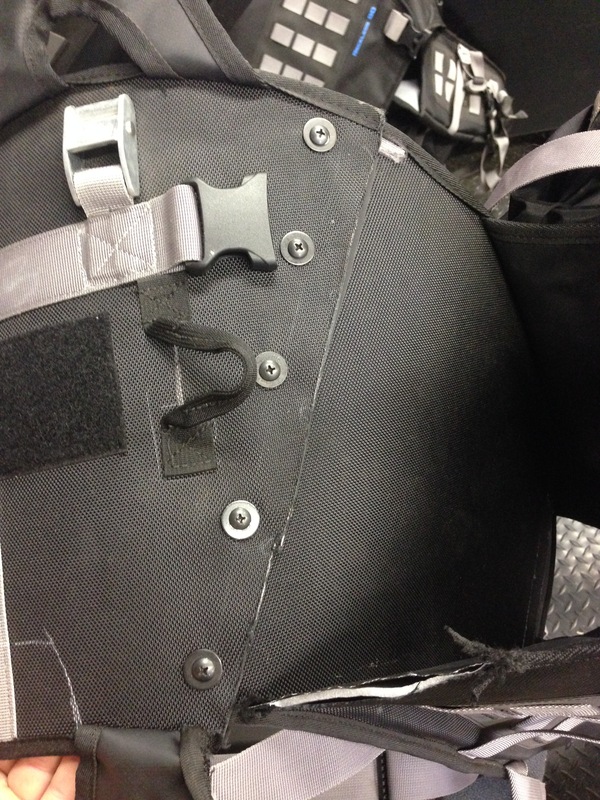 The underside of the harness will have a hypalon flap that covers the metal chicago bolts and protects the bike from abrasion scratches. 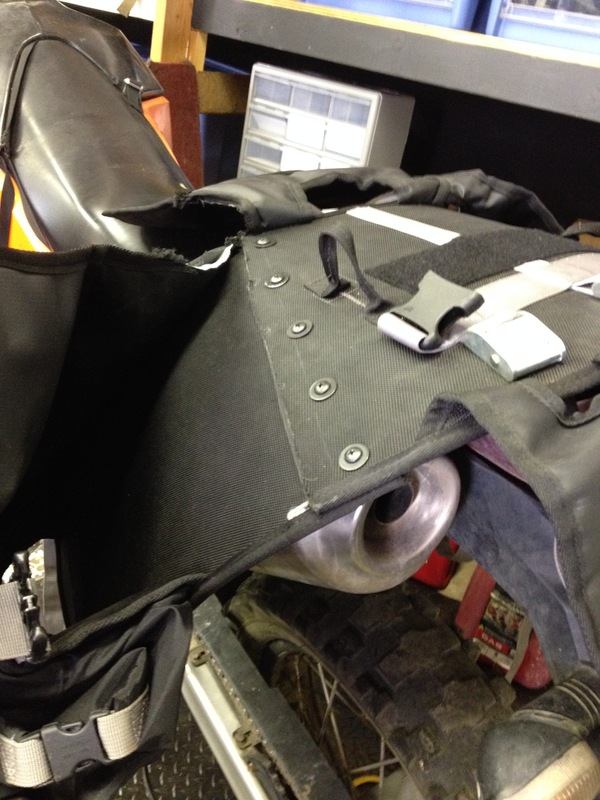 Next, there are some major changes coming to the centerpiece on the bag harness. The first and most requested change is that we’ll attempt to add a fuel fill hole for rear-fueling bikes like the KTM 690. So many riders have requested this, we’re going to give it a try. We’ve mocked up a rough prototype in our shop and we think it’s going to work. 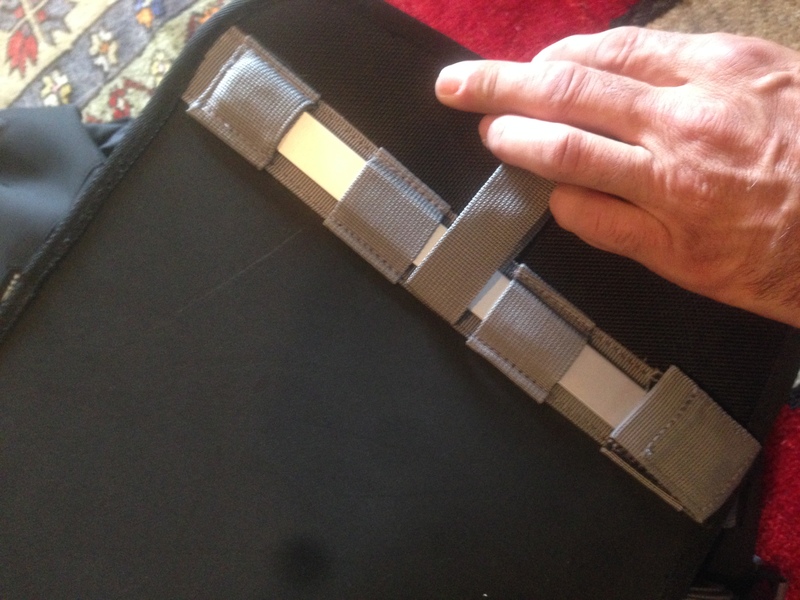 Next, instead of stitching the top buckles onto the bag harness, we’re going to use the same aluminum bar construction we’re currently using on the legs. That way all the load-bearing straps can be easily replaced/repaired in the field without a sewing machine. 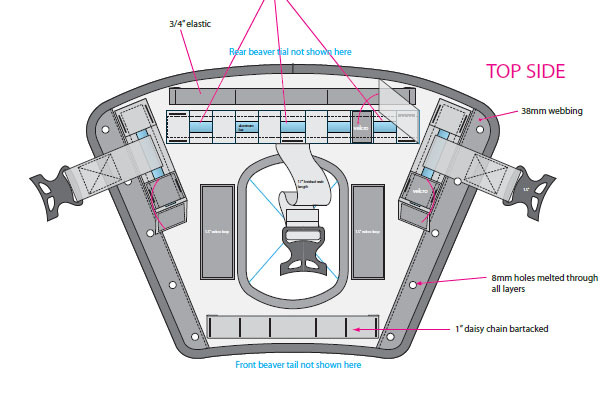 In the pic above you can see there will be three new aluminum bars on top, holding the attachment buckles down, and providing multiple attachment points for the rear connection straps. Additionally, we’re adding daisy-chain loops on the front/rear of the harness for riders who want to tie-down a different rear drybag than the one we supply with the R80. A number of riders are already swapping out different dry bags for different trips. In fact, I did that myself on my last trip, subbing a Scout 30L for the included drybag. 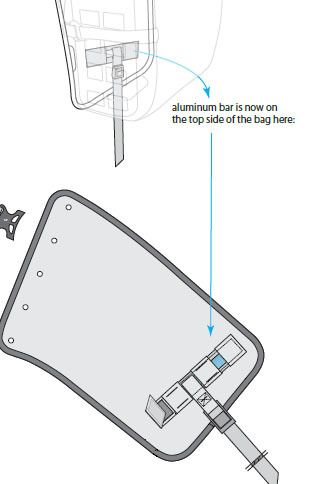 It works, and this will make it a little easier to secure the substitute drybag if desired. 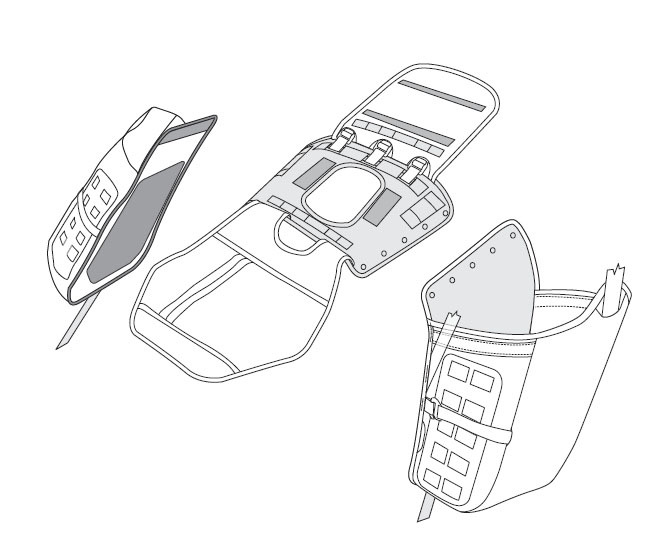 Finally, we’re changing the design of the rear drybag (not shown above) to accommodate all of the above. The roll top will now run parallel not perpendicular to the direction of the bike. As a reminder, here is what the aluminum bar design currently looks like on the legs. So this same construction will apply to the connecting straps on the top of the harness as well. 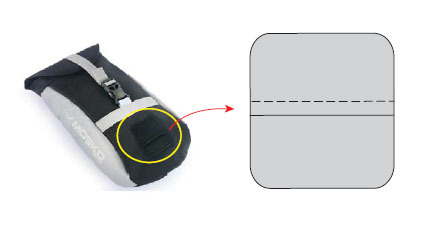 Next, we’re moving the leg attachment point (shown in the pic above) from the outside of the harness to the inside of the harness, behind the drybag. 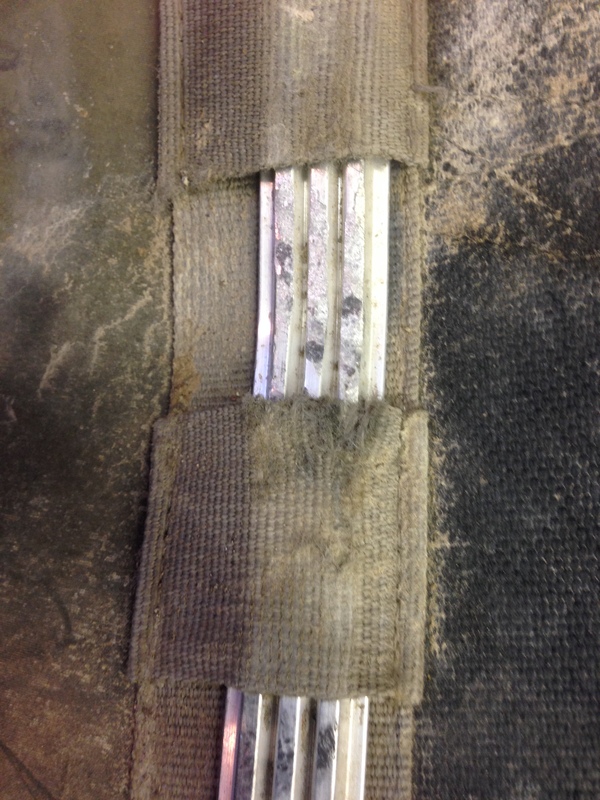 This will prevent wear on the webbing pockets that hold the aluminum bars in place. An example of that wear is shown below from my own personal bag. This only seems to happen on certain bikes/configurations, and if you experience it, it can be easily repaired with a hypalon patch attached with chicago bolts. 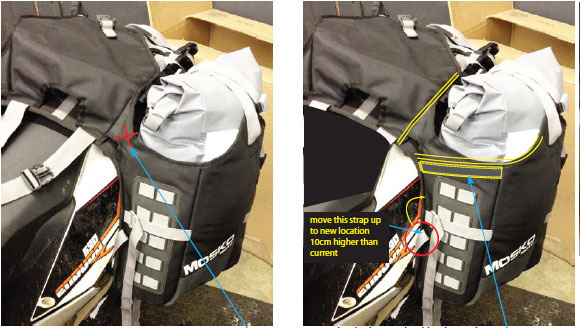 With the new three-piece design, we’re also eliminating the “corners” where the beavertail attaches to the side bags. These fabric connection don’t perform a function, and we never intended them to be load-bearing. We’ve found that on thinner profile bikes, especially where riders are carrying lots of additional items under the beavertail besides the included drybag, these corners are actually holding a ton of weight. So in the new design we’ll eliminate them entirely and reinforce the entire top edge of the side harness with 1″ webbing. Earlier this summer I noticed that the Reckless 80L rear pocket fits an MSR 2L dromedary bag perfectly. Then I went for a 35 mph pavement slide with the dromedary in there, and the plastic nozzle wore a hole through the pocket right where the nozzle normally sits, which actually turned out to be really convenient, because now I can get to my water nozzle without removing the drom bag. So we’re going to add a dromedary opening on the rear pocket just like the one on our large MOLLE ba, making the Reckless 80 rear pocket a convenient spot for water storage in addition to fuel bottles, tools/tubes, etc. 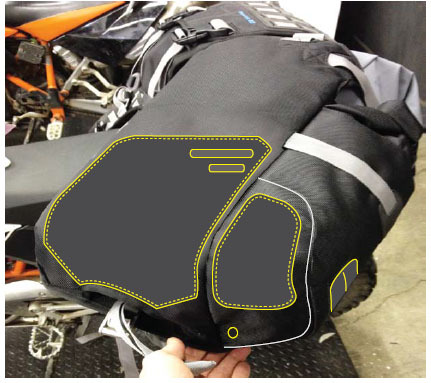 Now that we’ve observed (and personally experienced) a large number of crashes on the Reckless 80, both on pavement and dirt, we’re changing the position of the R80’s external hypalon armor panels to accommodate the wear patterns we observed, as show below. We found that in a slide, the bag actually moves and pushes, and some of the wear occurs on the bottom of the bag instead of on the outside edge. 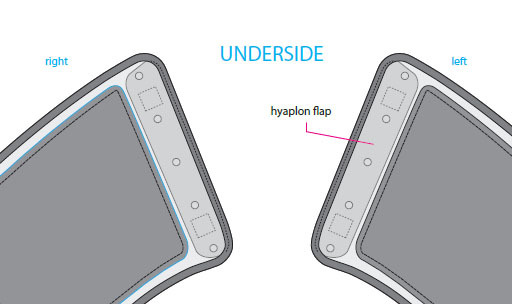 Finally, on all the connection straps, we’re adding sewn hypalon sleeves, which are adjustable and can slide up and down the webbing, to prevent the webbing from wearing through at the point where it attaches to the bike. This should prevent any long-term issues with webbing-wear on sharp corners, and the sleeves are easily replaceable if they do eventually wear through. We’re also moving to a different kind of webbing on the attachment straps, one that is substantially thicker, but which still works in the metal cam buckles we’re using. It’s hard to tell from the pic below, but imagine the kind of webbing you see on a typical windsurfing or kayak cam-buckle strap, as opposed to what you see on a typical backpacking pack. 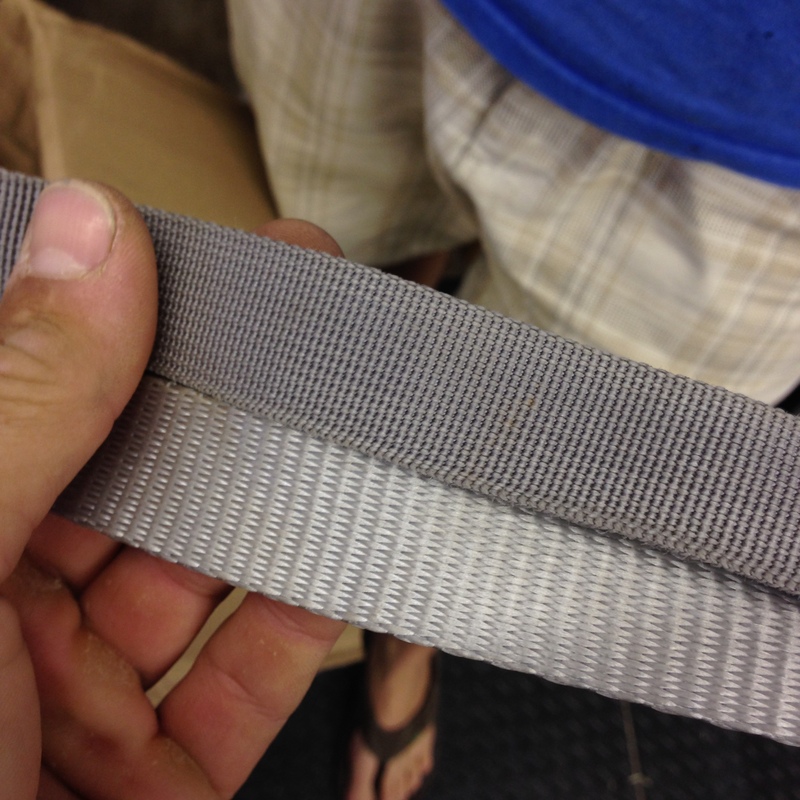 The new webbing is shown on the bottom in the pic below, the old webbing is shown on top. The above is by no means a complete list of revisions, just some highlights. We just finished this list and we’re working on a new prototype now, which is likely to be the first of several. We will post results as soon as we have them. Thanks for so much all the awesome feedback and input over the last several months. Hopefully you can see how much of it is incorporated above! The new version will be a bit heavier and definitely more expensive than the current version, but that kind of comes with the territory, since we’re adding a lot of new features and additional materials. For any folks who ordered a R80 version 1.0 this season, we’re also planning to offer a credit toward version 2.0 if you decide to upgrade at a later date. Not sure how that’ll work exactly but we’ll figure something out. The revision process may take several rounds of prototypes and we’re really not sure when it’ll be done, but we’ll keep everyone posted. Ok: I better get back outside to the booth! More on the KTM rally in the next post.